Beginning with the spy Harry Gold and expanding out to Germany, Great Britain, Norway, the Soviets and U.S. secret location of Los Almos, Bomb is a wild ride as the race to build the first atomic bomb is waged. Sheinkin provides interesting, exciting, detailed research, primary sources, photographs, and delivers a riveting heart pounding, page turner. This nonfiction title about the creation of the hydrogen bomb, has so many important characters that bear mentioning: Robert Oppenheimer, Tony Hall, Leslie Groves, Norwegian Knut Haukelid, and President Truman. 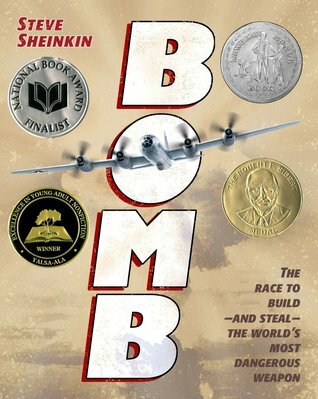 Bomb has aptly earned its award as 2012 National Book Awards finalist for Young People’s Literature.